Striving to transform a 20 year old business park into energy efficient office space with a stylish, contemporary finish, Greenhills Real Estate Ltd has installed two TORMAX all-glass manual revolving doors, combined with low-energy automatic swing doors for disabled access. 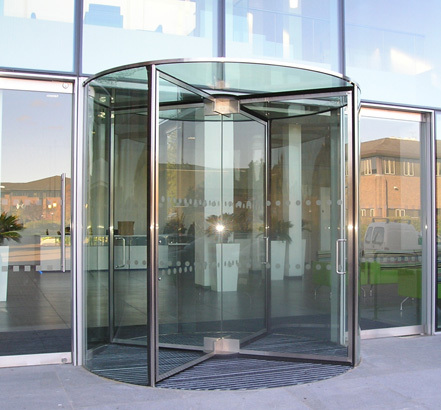 Set in impressive glass façades, the 4-leaf revolving doors positively contribute to a greener environment by helping reduce heat loss from the buildings whilst the automatic swing doors take full advantage of new iMotion technology which is almost entirely manufactured using recyclable material. 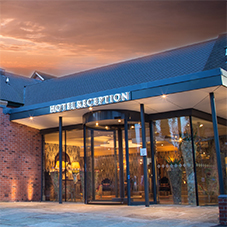 A 75 acre estate in Watford, Croxley Green Business Park is home to 50 companies with over 2,500 employees. The objective of Greenhills £3.6m refurbishment is to effectively recycle existing office buildings whilst expanding facilities to offer a vibrant, healthy working environment that is truly sustainable at every level, even going so far as to collect rainwater to flush the toilets. Maintaining the minimalist, all-glass frontage, the automatic swing doors are each powered by an operator concealed in a steel container set into the floor. Utilising the latest iMotion technology the TORMAX underfloor operator is tested well beyond current industry requirements and features a high powered synchronous motor which is gear-less, brush-less and does not have any parts which can wear out, delivering near-indefinite life-expectancy. 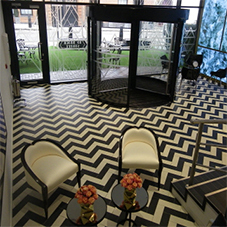 In addition, TORMAX iMotion technology requires minimal energy consumption to efficiently operate the doors whilst advanced sensors help ensure a cut in heat lost from a building by allowing doors to be set for reduced opening but automatically adapting when pedestrian traffic builds up from both directions. A user-friendly control panel allows site specific requirements to be easily accommodated. Automatically adapting door operation to take account of environmental factors such as a build-up or dirt or high wind conditions, iMotion combines low-maintenance with exceptional reliability. Obviously installing manual revolving doors eliminates any running costs and is ideal for low foot traffic situations such as at Croxley. 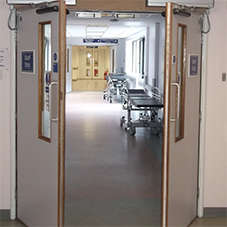 In busy locations where an automatic revolving door may be required to ensure smooth flow of pedestrian traffic, TORMAX door operators deliver one of the most energy efficient solutions on the market today.